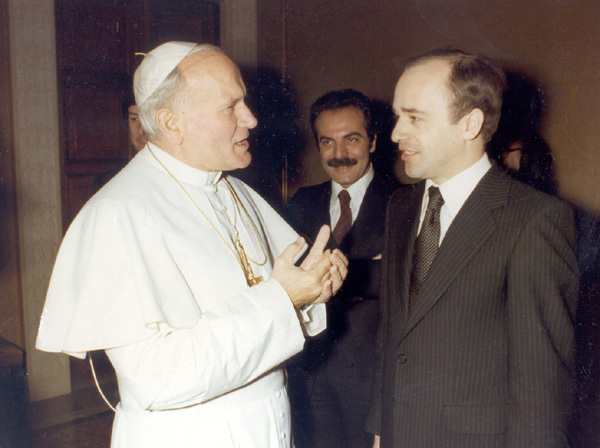 Dr. Hans Koechler meeting with His Holiness Pope John Paul II on 26 February 1979 at the Vatican's Apostolic Palace. The audience took place following Hans Koechler's lecture on "La fenomenologia del Cardinale Karol Wojtyła. Sul problema d'un'antropologia a base fenomenologica" at the Annual Conference of the Italian Section of the International Phenomenological Research Society in Viterbo near Rome (24 February 1979). Hans Koechler was the first philosopher who presented Karol Wojtyła's phenomenological anthropology to the English-speaking world in a lecture on "The Dialectical Conception of Self-determination: Reflections on the Systematic Approach of Karol Wojtyła" at the International Colloquium "Soi et Autrui" organized by the World Institute of Phenomenology at the University of Fribourg/Switzerland in January 1975. Cf. Analecta Husserliana, Vol. 6 (1977), pp. 75-80.